Can you tell us a little bit about yourself and your motorcycle journey around Australia? I'm Lincoln. I'm just some 29 year old Kiwi-Indian dude with an office job who had an early mid-life crisis (I actually wrote that in my resignation letter)! I like riding motorcycles. NZ is my home, so Australia is in my backyard, and the only continent you can realistically circumnavigate on a motorbike. So I did that. And thus my life as a nomad has begun. Well, I knew I was going to go all the way around. I knew I had about 3-4 months to play with. My folks live in Brisbane, so I would start and finish there. Due to the way the seasons work, the best way to decide clockwise or counter clockwise is to split the continent into north and south, and decide what the best time for each is. The "wet season" as it's called here in the north lasts from mid-November to the end of March. This period is dominated by almost daily tropical thunderstorms. Some towns and parts of the route can get completely isolated due to road closures from rising floodwaters. There's also an increased risk of getting bogged down on dirt roads during and just after this period. The winter in some parts of the south experiences road closures for a different reason: snow! This is around the July-August period. I wanted to go into the alpine region, but avoid that problem. I didn't want to wait, so I went counter clockwise: north before the wet, and south after the winter. You had a big crash with your bike in Queensland - did you feel any hesitation getting back up the bike again afterwards? No. I felt confusion, frustration, anger, pain, frustration again, sadness... and extremely lucky. In that order. But I didn't feel hesitation. What was the biggest breakdown you had with your bike and how did you manage to fix it? The crash on the way to Cape York. It was a nice bike and had to be written off. And no, I didn't manage to fix it. What is the most important and useful gear that a motorcyclist should bring for a motorcycle trip around Australia? Carry a phone with an Australian SIM. I used Telstra because they have reception in a higher number of remote areas compared to other providers. But for your own and your loved ones' peace of mind, carry a PLB/EPIRB with a valid Australian subscription. Make sure it works. Prepare for the worst, hope for the best. What was the longest stretch of road you did without seeing any town and how did you prepare to cover this stretch? Australia has a lot of these! I didn't keep track, but a memorable one was a 320 km along the Savannah Way between Hell's Gate and Borroloola. It's a dirt road with a lot of "dustholes", no fuel stops, and some river crossings. I didn't see any people the entire time either. I carried 8L of water, 33L of petrol (22L tank + 5L jerry can + 6L fuel bladder), and left earlier than usual. You are riding the Kawasaki KLR 650 for this journey. Why did you choose this motorcycle and how is it’s performance both on-road and off-road? I crashed that bike and wrote it off. Then went and bought a KLR650. I felt more resonant with it. It’s a very capable and gritty machine: more Mad Max, less 007. It’s a lot simpler, therefore easier to understand, and while not the fastest on the road, or most stable in the dirt, and probably with a typewriter instead of an engine computer, it gave me one hell of a mental and physical reward to get it to do what I want. Parts, modifications and servicing are easy, readily available, and cheap. It's a hearty beast. Very reliable. You mentioned to me you are planning to write a book about your journey. When do you think it will be ready and will it also be available as e-book online? The blog journals I wrote along the way ended up being more about the encounters and mental enlightenment I experienced than a traveller's account of things to do and see. Some of the stories are quite personal, and I had requests for a book. The idea is still in a conceptual stage. I have quite a few plans this year -motorcycle trips and otherwise, so I have no idea when it'll be ready. It'll probably be available online, because that's what all the cool kids like. You can also just check out the writing on the blog itself in the meantime. And tell your friends to tell their friends! 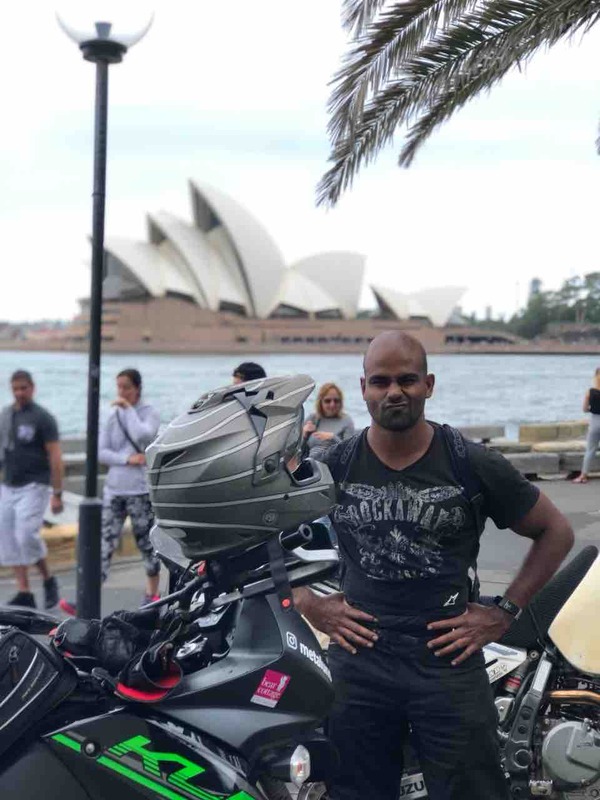 What are the best motorcycle online communities in Australia that you found helpful for planning, meeting fellow riders etc? The best advice for planning is checking the weather and terrain in advance. I used Google maps, Australian Topo Maps, and WindyTY. Even better is to check with locals at petrol stations, shops and truck stops as you go. What was the best experience you had on the road so far? Flying off a bike at 80kmph, landing on bull dust and clay 20 metres away. No bones broken. No ligaments torn. Feet and fingers pointing the direct direction. Not a scratch on my body... But a completely broken bike. Realising I was alive was my best experience on the road. Aftershot of the motorcycle after getting stuck in the mud.. Life on the road isn’t always easy! Lincoln is currently riding around New Zealand. Follow his adventures on Instagram!